A Decade of Hamas in the Political Arena - "Check Please"
Based on an article first published in the Jerusalem Post. February 2016 marks 28 years since Hamas's breakthrough (as the organization refers to the day of its establishment), and 10 years since its rise to the political field in democratic elections. This move constituted the first step in its takeover of the Gaza Strip, which was completed after 18 months of clashes with Fatah and the Palestinian Authority. The clashes resulted in the murder of over 100 militants on both sides, mostly from Fatah. Hamas's methods included torture, throwing the bodies of Fatah officers from tall buildings, stealing public funds, and deporting many Fatah supporters to Palestinian Authority areas and Arab countries. Hamas's takeover was, perhaps unintentionally, the almond tree that heralded the "Arab Spring". Erupting in earnest six years later, the spring in which the sun did not rise, the vine did not blossom, and the grenades bloomed into missiles, bombs, chaos, despotic regimes and thousands of casualties throughout the Middle East. Most of the countries in which the masses tried to bring forth the Arab Spring, are now submerged in much greater violence than before. In Egypt, after two years of the Muslim Brotherhood, a renewed military dictatorship arose. Libya is consumed in chaos. Yemen and Bahrain are divided in tribal conflicts. Only in Tunisia is democracy fighting for its existence. Following the failure of the United States to turn Iraq into a democracy, the process in Gaza should have served as a warning sign to the West: when you push for a democratic process in the Arab world, you are likely to end up with an Islamic, sometimes radical, regime that is anti-democratic by its very nature. Over the last three decades, Western leaders have refused to accept the fact that democracy for its own sake, which is imposed on an Arab/Islamic state, simply goes against the DNA of their cradle of civilization. Hamas, an acronym in Arabic for Harakat al-Muqāwama al-Islāmiyya, or in English, the Islamic Resistance Movement, and Hamas means also "zeal". Since its inception in December 1987, the movement has called for Israel's destruction, a basic fact that has never changed, not even when the movement began to operate as a political organization. A strange anecdote holds that the establishment of Hamas, which on the eve of its founding was a type of charitable organization, received support from Israeli defense establishment officials, who saw the organization as a counterweight to Fatah's rusticity associations. Hamas, to this day, maintains that the Israeli-Palestinian conflict is a religious conflict between Muslims and Jewish infidels, and that there will not be any concession of land in Palestine because the land is sacred. Hamas rose to the political arena in May 2005, when it won a local election in Palestinian Authority (PA) territory, with 60% of the total 400,000 voters in the PA casting their votes. It is important to remember that this took place three months before the disengagement from Gaza and Northern Samaria, and neither the Ministry of Defense nor the IDF saw the flashing red lights. Five months after the disengagement, in January 2006, the movement returned in the general election and won 76 out of 132 seats in the Parliament. A decade is, without a doubt, a long enough period of time for an analysis of the achievements and failures of a government organization; whether it is democratic, dictatorial, theocratic, or any lethal combination of the above with no clear separation between religion and state. It is also an opportunity, minor some would say, to partially examine the Israeli approach to its policies vis-à-vis Hamas. Let us try to see things from the personal vantage point of a resident of Gaza. Let us call him Mohammad Mahmoud Akram Zeitouni, in his early 70's (borne in 1954), a resident of the Zeitoun neighborhood in eastern Gaza City. He has clear childhood memories of living under Egyptian rule until the age of 13, and living under IDF rule from 1967 until 1994. If Mohammad gets up and ask for "penetrating criticism" after a decade of Hamas rule, he can - like us - compare it to the last 30 years that have passed for him and his family. During the first decade (1984-1994), Israel applied complete military control over the Gaza Strip. During most of the second decade (1994-2005), as a result of the Oslo Accords and the Gaza-Jericho First Agreement in particular, the Palestinian Authority, led by Arafat, ruled the Strip. During the third decade, Hamas took control of Gaza in 2006 and continues to rule there today. As stated above, this article focuses on the third decade but corresponds with the two decades that preceded it. Mohammad Zeitouni knows better than any reader or interpreter how to demand for "penetrating criticism", but only if he wants to do so, or if the people of Gaza could arouse even a fragment of the protest that they excel at aiming only at the "Zionist occupier". - Yasser Arafat, the man who I believe provided two accelerators to Hamas's rise to power, both during his life and in his death. The first accelerator was his refusal to fulfill his duty in the Declaration of Principles in the Oslo Accords (DOP - September 1993) and the Gaza-Jericho First Agreement (Cairo, May 1994), in the framework of which he avoided and evaded his obligation to disarm rejectionist organizations. Not only did he not fulfill his duty, he refused to commit what he referred to as "the Altalena of Ben Gurion". The second accelerator was the death of the almighty leader of the PA in September 2004, 13 months before the rise of Hamas. It can be said that Arafat's absence from the stage coupled with the presence of an armed Hamas were undoubtedly significant accelerators to the Palestinians' inability to establish a unified government, which led to a split in power from the Palestinian Authority. - Another accelerator event took place four months before the rise of Hamas. In August 2005, the Israeli government carried out the disengagement and evacuation of the settlements and IDF camps from the Gaza Strip and northern Samaria. The positioning of the IDF along the 1967 border surrounding the Gaza Strip left Hamas with a region free of Israeli "occupying forces", as the P.M Sharon administration and its advisors believed. However, the Palestinian leadership certainly did not think so. Major General (ret.) Giora Eiland, Chairman of the Israeli National Security Council, testified approximately one month before the disengagement that "the Palestinians are claiming that the borders need to be identical to those of 1949, just two kilometers north of Israel - and should include the relinquishment of Moshav Netiv Ha'asara". Based on personal information and private conversations with Mohammed Dahlan, I can attest to the truth of Eiland's statements. - The disappointment accelerator- a chain of "almost agreements" that took place in late 2008 between Abu Mazen and the PA, with the Israeli government. The events were overshowed by Hamas pressure on Abu Mazen and Prime Minister Olmert under investigation by the Lahav 433 unit. Incidentally, this "almost agreement" was no worse for the Palestinians than the agreement that was almost reached by Arafat and Barak in the summer of 2000; an "almost agreement" worthy of the name: The hope, the fear and the accusations, the main points apparently left scribbled on a napkin and on both sides of the Palestinian Authority's letterhead, containing the formula for territorial exchanges, an alleged waiver of Israeli sovereignty on the Temple Mount, the return of 5,000 refugees, and more. - The "support accelerator" - the Arab Spring protests in 2011 in neighboring Egypt, which is not among the "occupying forces"; protests that led to the rise of Hamas's ally, the Sunni Muslim Brotherhood, and their fall from power within two years during which the parties brought in heavy arms from Iran via Sudan-Egypt into the Gaza Strip. The Muslim Brotherhood was then outlawed under al-Sisi's rule. Egypt joined Israeli efforts to close its border with the Gaza Strip, a period that Hamas lamented as the spring that led to the "black winter". From the vantage point of the average Gazan, another gate to the giant pen in which he lived was closed. - The "more radical Islam" accelerator - the appearance of the Islamic State in Iraq and Al-Sham, which despite being fundamentally Sunni and seemingly sharing an ideological-religious line with Hamas, represents an extended Caliphate line and an aggressiveness that makes even Hamas feel threatened. The existence of Ansar Bayt al-Maqdis (Supporters of Jerusalem), a sub-organization of the Islamic State in Sinai, is a source of stress for the entire region, including Egypt, Israel and even Hamas in Gaza. - The political balance in Israel was again disrupted in what may have started as the Israeli public's response to Hamas terrorist attacks taking place since 2006, when a distinctly right-wing government was established at the start of 2015 and those who considered themselves centrist and leftist found themselves making faint protests from the benches of the opposition. Despite the difficulties presented by the vastness of the topic at hand, I will try to address each of the main outcomes and, wherever possible, to indicate the reasons behind them. In my opinion, the implementation of the disengagement process from Gaza in August 2005 suffered from three major flaws with respect to the Palestinians, which only seem to contradict one another. The first flaw was the abandonment of the border between Gaza and Sinai, known as the "Philadelphi Corridor". The Philadelphi Corridor essentially connects Gaza to resources such as weapons and ammunition, including munition that they had previously been unsuccessful at getting through the few isolated and small tunnels at their disposal. Since the completion of the IDF's withdrawal from the Sinai Peninsula, as part of the peace agreement with Egypt in 1982, the area has turned into the "Wild West", controlled by weapons and explosives smugglers, and human and drug traffickers. And so, small individual tunnels under IDF control in the Philadelphi Corridor turned into hundreds of wide tunnels through which even a loaded camel could pass, as well as trolleys carrying weapons, ammunition and, of course, missiles and rockets that generally came from Iran. When the plan to destroy approximately 7,000 residential units in Gush Katif settlements was published on the eve on the disengagement, I recommended implementing an outline according to which: a) the IDF would remain in control of the Philadelphi Corridor, b) a buffer zone approximately 800 meters wide would be created, and c) Palestinian families from the area would be moved into the houses set to be vacated in Gush Katif in return for vacating the crowded districts in which they lived. I believed then, and I am still convinced to this day, that this step would have made it possible to control the border, and prevent heavy weapons and explosives from entering the Gaza Strip. It would have ensured that any future clashes would be limited to small arms with negligible effects on both sides, as opposed to the rockets and missiles fired at Israel and the thousands of tons of bombs dropped by Israel in response. A historical reminder left over from the eve of the IDF withdrawal from Sinai, in May 1982, half of the houses on the Egyptian side were cleared of their inhabitants, who were then moved to a new neighborhood far from the northwest fence to Rafah (Tel al-Sultan). The operation was called "Operation Canada", named for the country that supplied the money for the operation. The families on the Egyptian side were moved to the new and spacious Tel al-Sultan neighborhood, and the houses were destroyed and the area next to the fence on the Egyptian side remained clear. So for those who claim that such a move would have been impossible in Gaza, there is no greater proof that the luxury villas of Gush Katif that we destroyed with bulldozers, could have remedied the issue of crowded houses of Rafah on the Gaza side, that tend to lack water and sewage infrastructure..
Ariel Sharon's advisors thought otherwise and recommended to him to evacuate the Philadelphi Corridor, claiming that failure to do so would leave Gazans with the accusation that Israel is an occupying state that controls them on all sides, as well as from the air. My response to this, is that Israel will continue to be considered an occupying state by the Palestinian people, as long as we are present in Jerusalem, Jaffa, Haifa, Lod, Ramat Aviv, Ein Hod, etc. The IDF left the Philadelphi Corridor to Hamas, Fatah and Egypt, which was not interested in protecting the border, but rather in allowing a smuggling freeway to flourish both above and below ground. Less than seven months after the disengagement, the first of many rockets fell next to Ashkelon, a 122 mm. Grad rocket. Since then, thousands of rockets and missiles from Gaza and thousands of tons and armament from the Israeli side, including targeted operations in which over 4,000 people were killed; not to mention the billions of Dollars that were spent by both sides instead of investing the money in developing the economy. To those who claim that by remaining in the Philadelphi Corridor with a protective strip of 800 meters, that the IDF would have sustained casualties, I would respond with two points. First, this is precisely what the initials of the IDF stand for - Israel Defense Forces - an army that is supposed to defend the State of Israel and its citizens. Moreover, we held on to Philadelphi at a strip of 40 meters during very difficult times and IDF soldiers handled it with bravery and resoluteness, so it was certainly possible to do so, militarily speaking, with a strip of 800 meters and clear of houses on the Rafah side. Secondly, since we have not held the Philadelphi Corridor, I would ask you to tally the losses suffered by Israel in terms of casualties and international standing, coupled with the losses on the Palestinian side, starting with the rise of Hamas (in "democratic elections") and ending with thousands of casualties, destruction, hatred, economic deterioration, and the delay of a potential agreement by several more decades. The second main flaw in the disengagement was the failure to find a formula for transfers between Gaza and Israel, between Gaza and the West Bank, and for goods between Ashdod and the Gaza Strip. Such a formula could have provided the people of Gaza with a sense of freedom from the end of a period of Israeli control instead of a complete detachment from the world. For instance, this could have been achieved by positioning a dock in the Ashdod port with a symbolic two-year lease with the Palestinian Ministry of Transport, to be supervised by the Joint Security Committee, which was still functioning well since its establishment in 1994. Meanwhile, Israel should have encouraged the initiative for an international body to establish a port in Gaza, an initiative that was on the agenda for years among supporting countries, as well as the PA and Israel. Israel should have declared - even unilaterally - that if the dock system in Ashdod will work, and the Palestinian side will not exploit it to bring in weapons, then the construction of a port in Gaza would also begin. This would certainly have resulted in a sense of freedom and hope, as well as economic prosperity and perhaps even the continued control by the PA and Fatah over the Gaza Strip. Mohammed Dahlan, who was in the PA government at the time and was someone that we sometimes listened to, then said: "The problem is that Israel wants a disengagement plan that strengthens the occupation - a disengagement plan that refuses to shake the perception of the occupation and this is not only bad for the Palestinians, it is also bad for the Israelis. This is what we want to prevent…another 1,500 Palestinian families stuck at the Rafah crossing for two weeks. This is what we want to stop, we repeat our demand for complete control of the crossings and complete control over the lives of the Palestinian population. However, we do not accept a disengagement plan that leaves the Palestinians under Israeli control". He made this statement approximately a month prior to the disengagement. The third flaw following the disengagement was the failure to change the Gaza counter-terrorism policy, both in terms of the political approach with regards to defining the goals of war or large operations ("Cast Lead", "Pillar of Defense", "Protective Edge"), and the military approach with regards to military capabilities and proposals - a change that would have had to be made to the "landlord has gone crazy" approach. The battle against Hamas needed to be combined with the adoption of an offensive and preventative initiative instead of hasty and reactive response to shooting attacks against Israel. We must remember that none of the three major campaigns, nor the five smaller operations, carried out by Israel in Gaza were a preventative or surprising initiative. Operation "Summer Rains" in June 2006 began as a response to the murder of two IDF soldiers and the abduction of Gilad Shalit by a cell that came through a tunnel to the Israeli side and ambushed his tank. Operation "Cast Lead" in December 2008 took place as a result of massive Qassam and Grad rocket fire against Israeli citizens, cities and settlements. Operation "Pillar of Defense" in November 2012 began as a result of increased rocket fire on Israel and an anti-tank missile strike against IDF soldiers on the Gaza border. Operation "Protective Edge" in June 2014 was launched after the abduction of three teenage boys in the West Bank and in response to Hamas fire against Israel. Practically speaking, after the disengagement, the Palestinian Authority - immediately followed by the leaders of Hamas in Gaza and abroad - chose to take an aggressive line against Israel, claiming that there was a continued occupation, even though there were no "Israeli shoes" on the ground, except for operations and raids carried out as a belated response to a series of attacks and steep trajectory fire against the Israeli population that reached Tel Aviv. We arrived at the current impasse due to a failure to take significant steps alongside the unilateral disengagement, coupled with the misunderstanding that conventional deterrence against countries, which usually includes a demonstration of capability, intention and determination, does not work against a terrorist organization. Over 60 years of conflict with the Palestinians, it is enough to teach us that such demonstrations may even do the opposite of deterrence when it comes to terrorist organizations. So what did our example, Mohammad Zeitouni receive? A decade of feeling imprisoned and a setback in his quality of life as compared to the two previous decades. Apparently, even his children were forced to dig war tunnels between Hamas posts, and attack tunnels from the Zeitoun neighborhood to Nahal Oz in the Gaza envelope. Against whom would Mohammed Zeitouni make his claims? At this stage, still not against the Hamas leadership, which succeeds - through brutal repression, propaganda and incitement - in making him think that only Israel is to blame. In addition, the confiscation of construction equipment from building material stores and the nationalization of all metal workshops in the neighborhood for the purpose of the Hamas weapons industry did not help Zeitouni to realize the order of priorities between his well-being and the welfare of the Palestinian people in the present generation, and the execution of Hamas's mission. Occupation or no occupation, a strong economy in the Palestinian Authority must be a strategic interest for Israel and for PA leaders. The size of the entire Palestinian economy is only approximately 4% of the Israeli economy. According to a report published by the World Bank last spring, the unemployment rate is at 50%. Among the young people, the unemployment rate increases to 60%. The state of the Palestinian economy will only deteriorate, according to the report, due to "barriers in Israel and Egypt, frequent wars and poor social services". Imagine the state of the Palestinian economy without the last decade of bloodshed and bombings; perhaps with small preventative operations against terrorist organizations but certainly without Operations Lead, Cloud and Edge, or "Lead-Cloud-Edge". Now imagine the Israeli economy and tourism without "Lead-Cloud-Edge" and the eight interim operations that were carried out before and during. It does not only affect Gaza. We see damage to the economy and tourism industry throughout the PA and Israel after every round of fighting. For example, 90% of the economy of Bethlehem and East Jerusalem are based in tourism, which becomes paralyzed for several months after each round of fighting in Gaza. Any intelligent person understands that the retreat from integration and move towards radicalization experienced by Israeli Arabs has gained momentum during this decade. They see the suffering of their Palestinian brothers and they may even take pleasure in seeing the people of the country in which they live as citizens, including those in Tel Aviv, Hadera and "beyond Hadera", holed up in shelters and protected rooms for over 120 days. What three armies failed to do to Israel during the Six-Day War in 1967, and what two armies failed to do in the surprise attack of Yom Kippur in 1973, two terrorist organizations and several dozen stabbers have accomplished. PA-supporting countries claim that 38 billion shekels in support sent by the global community were swallowed up without seeing any serious growth. An investigation carried out by these supporting countries found that most unemployed individuals receive a salary from the PA, including PA employees who sit at home and prisoners incarcerated in Israeli jails whose salary sometimes reached 15,000 NIS per month. This grim fact is presented here as an illustration of how weak and inefficient the international community's ability is to control what is happening in the PA in general, and in Hamas territory in particular. Now the obvious question is if salvation will come from Egypt. Even this is doubtful. Egypt continues to be busy trying to stabilize its power in the short and medium term, dealing with the outlawed Muslim Brotherhood and controlling the Sinai Desert, over which Ansar Bayt al-Maqdis (associated with the Islamic State) has cast terrorized. Add to this the continuation of the tightened closure on the Gaza Strip and its separation from Sinai, and I do not see salvation or substantial assistance from Egypt to Gaza in the near future, certainly not as long as Hamas continues to hold power. - High-trajectory fire on the settlements around the Gaza Strip over a period of ten years, with few pauses and massive fire (on the entire State of Israel, including the Second Lebanon War) for a total of over 150 days from 2005 to date, over 15,400 rockets and mortar bombs, 33 civilian deaths and approximately 1,500 injured. - Three large rounds of fighting and eight smaller operations in Gaza, none of which changed the situation in the Gaza Strip in any substantial way. Moreover, they all ended without a clear outcome, pushed away the chance of a political settlement even further, and did not quite restore Israel's deterrence against Hamas and Hezbollah. In the absence of such a study, we will have to be satisfied with explanations that find a deep connection between the security situation, and the rise of the moderate-right leaning parties in Israel, alongside the radicalization of the delusional right. Here we must make a casual note of Hamas's enormous contribution to the rise of the moderate and radical right in Israel, with its terrorist attacks from 1994-1996, among the worst of which were the attacks that occurred on the eve of elections in May 1996, in which Netanyahu scored the victory. The conclusion regarding the need to replace the Hamas regime is indeed obvious, but the likelihood of it happening without an internal change to the approach of the Palestinian people is almost impossible. Hamas is the most brutal perpetrator of human rights offenses in the region between Jordan and the sea. All sides would benefit from a replacement of Hamas's rule, but only if it happened as an internal step in a protest by the residents of Gaza. I am aware that such a step is virtually "science fiction" but that is not to say that it is not an option for Gazan, Mohammed Zeitouni, and others like him who truly want to live in peace. As high as the shelf may be, the harm suffered by climbing to it will be less than the harm suffered by another decade like this one. The initial sounds of protest are beginning to be heard. Recently, a young Palestinian man protested in front of Khaled Mashal, Chief of Hamas's political bureau, during a conference in Malaysia and presented a host of allegations written to him by a friend living in Gaza. Gazan interviewees already dare to say that if real democratic elections were to be held today, Hamas would lose. Is this the beginning of the "Palestinian Spring"? Will young Palestinians know to demand for their leaders to be accountable for the outcomes of the struggle during their lifetime? Probably not in the near future but maybe against the backdrop of a pragmatic, Palestinian leader from the new generation (Barghouti? Dahlan?) who will come after Abu Mazen. In the meantime, the final years of Abu Mazen's life will probably continue to be years of survival, at the end of which, he will join Yasser Arafat as just another leader who did not give up the Palestinian dream of a state from the river to the sea with Jerusalem as its capital. Of course, the possibility for change based on a Palestinian revolt against its leaders can only happen through the efforts of Israel and the international community, which would include strengthening the population in Gaza and the West Bank until it no longer needs to put its trust in a radical organization that worsens the situation, and creating a situation in which it will be clear to the ordinary citizen that there is a carrot and stick, and that the one holding them back is not Israel, but rather Hamas. Hopefully, this will encourage them that it is preferable that it be passed to a more moderate Palestinian leadership. The stick: if there are shootings or attacks in Israel that originate in Gaza or the West Bank, they will suffer a complete shutdown, the destruction of homes, damage to infrastructure and a difficult life. The carrot: if there a period of quiet, they will enjoy economic prosperity, the ability to go out to work, access to the Ashdod port, ongoing transfer of tax payments stuck in governmental departments in Israel, and more. Meanwhile, even at this moment there are dozens of attack tunnels between Gaza and Israel that are being dug by "slaves", some of whom are children. Hamas continues to smuggle and produce missiles and rockets, as evident in this quote from a recent The G.S.S (The Israeli General Security Services) report: "From the point of view of Hamas, achieving military build-up is the top priority, even before concern for the welfare, advancement and rehabilitation of the civilian population in the Strip. 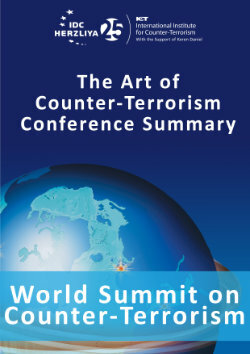 In this framework, Hamas has recently been channeling most of its resources into the extensive procurement of goods, including dual-use materials (that can also be used to manufacture weapons), which are brought into the Strip through collaboration with dealers from the West Bank and Israel, and the smuggling of these materials, whose entrance requires a special permit, while disguising them as harmless materials. Most of the materials, including electronic and electrical equipment, communication equipment and raw industrial materials, are used to repair and improve the attack tunnel system, produce weapons - especially rockets - and create technological systems to support warfare." Recently, it became known that Hamas in Gaza is trying to stabilize relations with Ansar Bayt al-Maqdis, a sub-organization of the Islamic State in the Sinai, which is likely to agree "temporarily" to these relations due to pressure from Egyptian security forces in Sinai. Given this reality, coupled with the continued attempts of these and other policy initiatives (that, unfortunately, seem impractical given the reality), the IDF and the State of Israel must make fundamentally different military preparations (than those from "Cast Lead", "Pillar of Defense" and "Protective Edge") for the next round with Hamas, which does not have to be an all-out war. Without delving into the tactical details (which I presented during my eight years of reserve service as Deputy Commander of Southern Command), the process must be an initiative of preventative action and not action in response to abduction/explosives/rockets directed at schools, etc. Israel must take the initiative to make a fundamental change between the starting point and finish line of the operation, as well as engage in economic cooperation in order to improve the state of the Palestinian Authority in general, and of the Gaza Strip in particular. The Altalena Affair or "The sinking of the Altalena"- Prior to the establishment of the state, several armed Jewish militias protected early Jewish settlers and fought against the British and hostile Arab forces. On June 20, 1948 just over a month after the State of Israel was established and shortly after the first cease fire in the War of Independence, Israel's first Prime Minister, David Ben-Gurion, gave one of the country's most controversial orders ever - to take the Altalena by force. The Irgun cargo ship, Altalena, was attacked by Israeli Navy gunboats, sixteen men were killed and scores of others wounded. The Altalena incident was a flashpoint between political rivals in Israel’s earliest statehood days. This article does not deal with the government’s mistakes vis-à-vis the settlers of Gush Katif, which I discussed in an article titled, "Takes One to Tango", Haaretz, October 2009. The border delineation, which was originally established in the Sykes-Picot agreements in 1916 and later in various incarnations of armistice agreements between Israel and Egypt (Rhodes Agreements 1949-1950), and was essentially insignificant until the IDF’s withdrawal from Sinai in May 1982. Once the tenant or the neighbor starts to act like crazy, the landlord may go crazy and change the all rules and his behavior. February 2, 2016, "Ma Boer" Razi Barkai - IDF Radio Station. The views expressed in this publication are solely those of the author and do not necessarily reflect the views of the International Institute for Counter-Terrorism (ICT).